Eleanor Crosby Lanier is the University of Georgia School of Law's associate dean for clinical programs and experiential learning, and she is a clinical professor teaching General Civil Mediation and Elder Law. She also manages students participating in the law school’s Mediation Clinic, which serves Athens-Clarke County. Lanier is a registered mediator and arbitrator with the state of Georgia Office of Dispute Resolution and is qualified to mediate a wide range of disputes. Her teaching and mediation activities are informed by over 20 years of experience in providing and improving the delivery of legal services to older persons in Georgia, where she developed and managed the Georgia Senior Legal Hotline. She has been a pioneer in promoting the use of mediation in elder care disputes, providing training for mediators in several states and working with the Association for Conflict Resolution to develop training objectives for mediators in elder care, long-term care and adult guardianship cases. 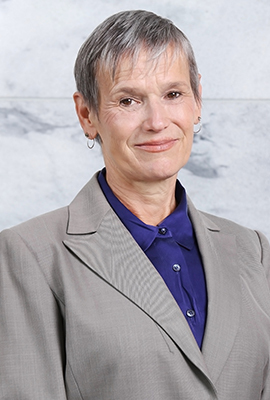 She has published law review articles on adult guardianship and the ethics of Medicaid estate planning as well as numerous articles for the Georgia Bar Journal and for ABA publications including the Commission’s Bifocal and the Senior Law Division’s Experience magazines. A member of the American Bar Association Commission on Law and Aging and the State Bar Access to Justice Committee, she is passionate about increasing access to justice and finding ways to introduce law students to creative ways to address unmet needs for legal help. She is an active trainer at continuing legal education sessions and national conferences on topics ranging from ethics and professionalism to dual practice traps in mediation. A recipient of numerous honors for her work, including the State Bar of Georgia’s Daniel Bradley Award, Lanier received her bachelor's degree from Vassar College, her master's degree in political science from UGA and her J.D. from the Emory University School of Law. Athens Access to Justice Initiative: Judicial Leadership + Bar Support + Local Resources = Powerful Synergy, 23 Ga. B.J. 26 (2018). Ethical Challenges of Using Law Student Interns/Externs to Expand Services to Low-Income Older Adults, 37 Bifocal 55 (2016). First Do No Harm: Why Mediator Competency Matters in Eldercare Cases and What the Mediation Community is Doing to Develop Qualified Practitioners, 3 Experience 23 (2015). Help is on the Way: Senior Legal Hotlines Respond to Elder Abuse, 3 Fam. & Intimate Partner Violence Q. 187 (2010) (with D. Mandel); (reprinted from Victimization of the Elderly & Disabled (Jan./Feb. 2009)). Adult Guardianship in Georgia: Are the Rights of Proposed Wards Being Protected? Can we Tell?, 16 Quinnipiac Prob. L.J. 249 (2003) (with R. Nathan). Ethical Considerations in Medicaid Estate Planning: An Analysis of the ABA Model Rules of Professional Conduct, 62 Fordham L. Rev. 1503 (1994) (with Ira Leff).